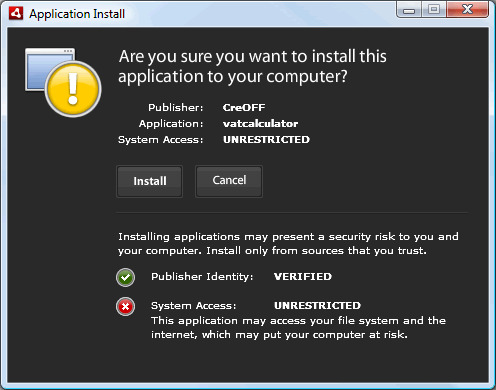 Since Adobe AIR apps can do a lot of good but also bad things on your pc it’s important to be sure that this AIR application really is coming from the publisher (CreOFF) and not some third party posing as CreOFF after having added who knows what kind of malicious code to the AIR app or maybe even just writing fake code. A signed application will have a green checkmark and the word “VERIFIED” after the “Publisher Identity” label. This way you can be sure that the code inside was really created by CreOFF. The VAT Calculator in it’s AIR version has been updated to 1.01 - no significant changes to the source code have been made except digitally signing the AIR package.